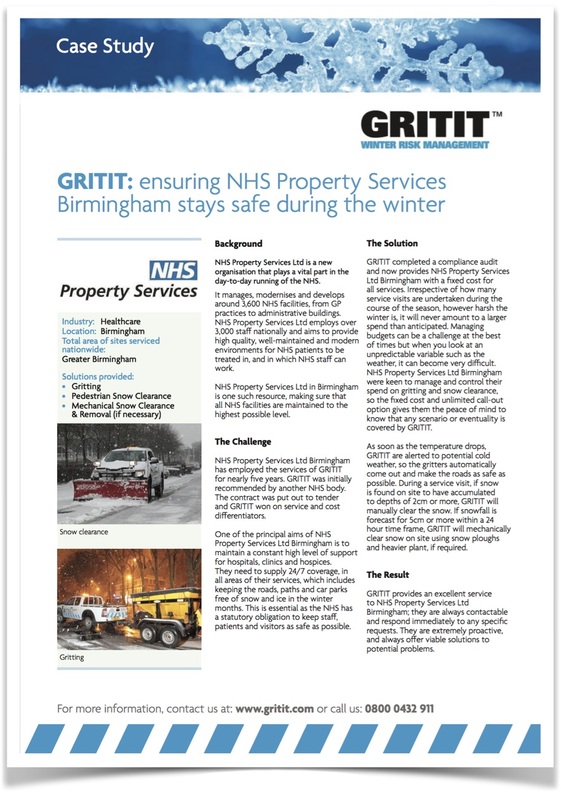 GRITIT's pioneering snow work in partnership with NHS organisations maintains safe, efficient, sustainable and modern healthcare working environments, for staff and visitor alike. Our winter teams make sure that your areas are always gritted, clear from snow and above all, uninterrupted and safe. Our summer teams and grounds department provides a complete grounds care and maintenance service for any type of outdoor space. From weed control work to landscaping , read more about our services and don't hesitate to get in touch to see how we could help you. We weed, we mow, we grit, we de-ice, we clear snow and we're on the case 24/7, 365/365. Hospitals need to be operational 24/7, 365/365. GRITIT knows that you don't want to deal with a different person every week, so we keep our teams consistent. This means our teams are sensitive to your site and know what needs to be done, constantly learning. GRITIT creates a safe environment for the stakeholders. GRITIT meets the strict compliance requirements for your obligations. GRITIT - gritting, snow clearance, potholes, grass cutting, hedge cutting, grounds maintenance - we can do it all for you! it's much easier dealing with a single supplier than having separate people do your grittting, snow clearance, pothole repair and grounds maintenance. GRITIT already has the local manpower and knowledge of your site. Why would you want the admin and hassle of dealing with all sorts of subcontractors when our trusted and dependable teams have the skills, the equipment, the training and the certifications you need? GRITIT has the budget options to make managing your annual budget simpler.